Kilburn Place possède deux unités. Cette liste est pour Unit One qui offre un logement exceptionnel dans le nord du New Hampshire qui est plus confortable et moins cher qu'une chambre d'hôtel pour des séjours prolongés. Près de réseau de sentiers, domaines skiables (Cannon, Loon, Bretton Woods), et bien d'autres activités hivernales. Ce est l'endroit idéal pour appeler 'maison-base »au cours de ces escapades d'hiver. Notre court terme et exécutif logement à long terme est pratique et flexible, idéale pour les professionnels et les voyageurs dans le milieu de réinstallation, des projets spéciaux ou des programmes de formation. Kilburn Lieu peut accueillir tous vos besoins en matière de logement, à court terme professionnel ou personnel et rendre votre séjour aussi confortable que possible. Le charme de cette ancienne 115 années 'New Englander' n'a pas disparu avec l'espace récemment rénové y compris tout de haut débit (sécuriser) Internet pour vos verres à vin. Un endroit chaleureux et accueillant pour appeler «la maison». Des chambres luxueuses, de grandes attractions locales et un quartier calme, véritable havre de paix vous attendent! Une unité dispose de 2 chambres, 1 salle de bain et 4 couchages. Veuillez vous renseigner sur nos week-ends d'apiculture de saison. Nous serions ravis de vous préparer et de vous mettre au rucher! Détendez-vous dans cette griffe pied baignoire profonde ou utiliser la fonction de douche. Empilable laveuse / sécheuse est situé dans le placard de la salle de bain pour votre commodité. My two favorite things about the property were the comfy king size bed and the claw foot bathtub. The location is close to grocery, gas, and restaurants. We enjoyed being close to Bretton Woods for zip lining and to the beautiful Franconia State Park ( a must see if you are in the area). The house is well maintained and squeaky clean. The kitchen is well stocked if preparing your own meals. We did buy candy at Chutters(candy store with longest candy counter in the world) and we don’t even have a sweet tooth, but we do enjoy dark chocolate. My husband and I were so impressed with Janice's house and the apartment in which we stayed for three nights. Very clean, quiet, and so close to downtown Littleton (about a 10 minute walk). Neither of us had ever been to Littleton (we were in the area for a wedding), but now that we know about Janice's place, we will definitely be back to explore the area. Thank you for the great review Julianne! We love having our guests feel comfortable and relaxed. Glad we could afford you a great experience here in Littleton. Come back anytime! 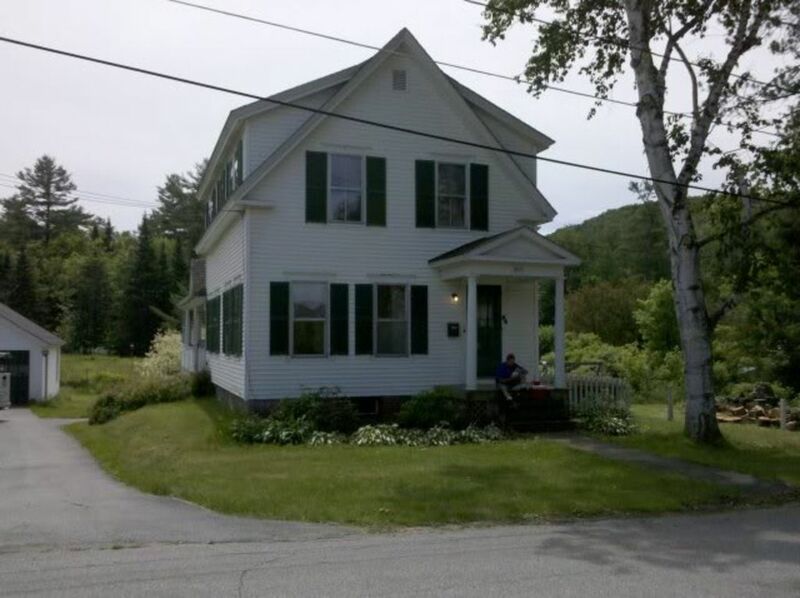 We enjoyed our stay in this beautiful house in LIttleton New Hampshire. The house was immaculate, and we had everything we needed for our stay. Its a short walk to LIttleton Center, which was important to us. Littleton is one of the most beautiful small towns in the United States, You can walk to many fine restaurants, and check out the many interesting stores for shopping. and we would strongly encourage anyone to visit LIttleton.. Our unit had an eat in kitchen, with everything you needed to cook for yourselves. The bathroom was large, with an old fashioned bathtub that even I could fit in (I'm 6'1).It also had a washer and dryer, which was nice as you generate a lot of dirty clothes on vacation in the Summer. There was an abundance of towels and washcloths, and anything else you might need. The main bedroom is large, with a comfortable bed, and gets the beautiful morning light as you wake up. The 2nd bedroom had a sleeper sofa that my son found to be very comfortable. The unit has cable tv and air conditioning, which we both enjoyed using. We did a lot of hiking, as we were very close to the many hiking trails in the area. Once again we had a wonderful stay, and would love to come back again. I know for a fact that we will recommend this wonderful house to anyone! Adorable house right in town with everything you could want. Walking distance from Main Street. This is a house that has been divided into two apartments. It is clean, comfortable, has everything you need, walking distance to Main Street and other local attractions, a 5 minutes drive to major grocery stores, and a short drive to national parks and lakes. The place was all ready for us when we arrived so much so that we never needed to ask any questions of the owners. We will definitely stay here again on our next trip to Littleton, and there will be a next trip. You need weeks to enjoy all it has to offer. We loved staying there. It was clean, well stocked and very convenient. Janice and Joe make great hosts! Great location, lots of character! My sister, mom, and I were here for a long weekend and it was such a lovely stay! The house was very clean when we arrived (my mom even took a bath in the clawfoot tub without a thought). The sofa bed in the second room was pulled out and made up for us. The mattresses in both rooms were very comfortable. The house was perfectly appointed - there were plenty of towels, spare toiletries in case we forgot something, extra blankets, plenty of hot water, everything we needed and nothing we didn't. The house is a quick and pleasant walk to town (with sidewalks) and we had breakfast and dinner in town most days. If you are a light sleeper, just know that an upstairs neighbor can be heard (floor creaking, walking), as is expected with a home this age. All in all, we were very pleased with our stay and would definitely stay here again. Thank you, Janice, for a wonderful experience! Près de sentiers de motoneige.